Calford MB. 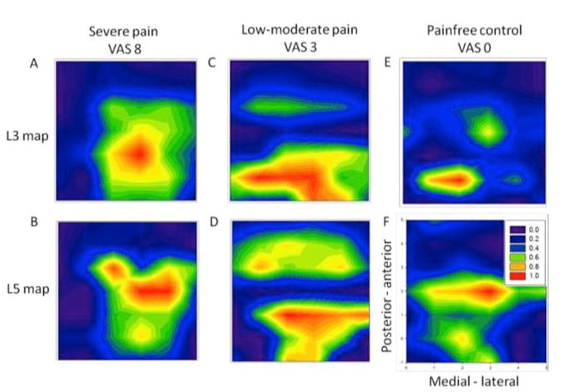 Mechanisms for acute changes in sensory maps. Advances in Experimental Medicine and Biology 2002;508:451-60. Beales D, Lutz A, Thompson J, Wand BM, O’Sullivan P. Disturbed body perception, reduced sleep, and kinesiophobia in subjects with pregnancy-related persistent lumbopelvic pain and moderate levels of disability: An exploratory study. Man Ther. 2016;21:69-75. Hancock MJ, Maher CG, Latimer J et al. Systematic review of tests to identify the disc, SIJ or facet joint as the source of low back pain. European Spine Journal 2007 October; 16(10): 1539–1550. Haneline T, Young. Areview of intraexaminer and interexaminer reliability of static spinal palpation: a literature synthesis Journal of Manipulative and Physiological Therapeutics 2009; 32(5): 379-386. Laslett M, Aprill CN, McDonald B, et al.Diagnosisofsacroiliacjointpain: validity of individual provocation tests and composite of tests. Man Ther 2005;10:207–18. Laslett M. Evidence-based diagnosis and treatment of the painful sacroiliac joint. J Man Manipulative Ther 2008;16:142–52. Luomajoki H et Moseley L. Tactile acuity and lumbopelvic motor control in patients with back pain and healthy controls. Br J Sports Med 2011;45:437–440. Moseley GL. I can’t find it! Distorted body image and tactile dysfunction in patients with chronic back pain. Pain. 2008;140(1):239-43. Pascual Leone et al. The plastic human brain cortex. Annu. Rev. Neurosci. 2005; 28:377–401. Rajendran D, Gallagher D. The assessment of pelvic landmarks using palpation: A reliability study of undergraduate students .IJOM. 2011; 14: 57-60. Schabrun SM, Elgueta-Cancino EL, Hodges PW.Smudging of the Motor Cortex Is Related to the Severity of Low Back Pain 2015 Spine. Seffinger MA, Najm WI, Mishra SI, Adams A, Dickerson VM, Murphy LS, et al. Reliability of spinal palpation for diagnosis of back and neck pain: a systematic review of the literature. Spine 2004;29:413-25. Stochkendahl MJ, Christensen HW et al. Manual examination of the spine: a systematic critical literature review of reproducibility. J Manipulative Physiol Ther 2006;29(6):475-485. Wand BM, James M, Abbaszadeh S, George PJ, Formby PM, Smith AJ, et al. Assessing self-perception in patients with chronic low back pain: Development of a back-specific body-perception questionnaire. Journal of back and musculoskeletal rehabilitation. 2014;27(4):463-73. Bel article. Intéressant. Bravo Laurent !